Although on large commercial projects there are other options available, for small and medium commercial properties – offices, hospitals, schools, colleges and universities, and a myriad of public sector buildings – radiators still offer a sensible and attractive option. New designs make radiators aesthetically pleasing as well as energy efficient. This is particularly true in the replacement market and in smaller commercial properties. 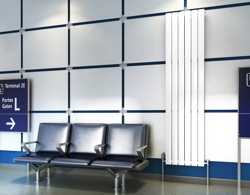 New designs have seen radiators making something of a resurgence in the commercial field. Colour is a new concept in a sector where, to paraphrase Henry Ford, you could have “any colour, so long as it was white”. Now it’s possible to match or contrast radiators to corporate colour schemes or simply to liven up the décor in the most visible parts of a building – for example, the reception area. Radiator manufacturers have responded with the design and provision of new offerings that meet specific commercial requirements. For example, Stelrad’s flat-fronted, slimline Planar design has morphed into Planar HD – a heavy duty version, designed to withstand rougher treatment in busy buildings. It was originally designed to withstand the knocks associated with a postal sorting office with trolleys and small trucks patrolling the corridors and occasionally coming into contact with the radiators in the building. Other features that make radiators a suitable choice for commercial buildings, include rust resistance. This can offer a good solution for areas such as changing rooms in sports facilities, spas and swimming pools. 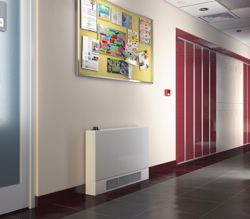 In education and healthcare, the provision of heating without the danger of hot surfaces is important. Low surface temperature radiators (LSTs) offer an important and safe form of heat. LST’s come with a casing that surrounds the radiator allowing the heat to convect in the normal way, whilst ensuring that the casing at no time exceeds 43°C They offer a degree of safety from radiators that are ‘safe to touch’ for people of all ages and those who may be vulnerable. These comply with strict requirements of the NHS Guidance Note for ‘Safe hot water and surface temperature’ and can be installed in commercial and public buildings running heating systems with total public safety assured. To be as efficient as possible its vital that radiators in any building – be it a home or an office or a school – are sized correctly. Radiators rarely operate at full capacity, so sizing for the highest realistic requirement will ensure that the system is always able to heat the space efficiently. Radiators these days can be smaller because of the reduced water content required and because of the far superior water channel design which ensures the water travels through radiators better, coming into contact with more of the metal so that the radiators can do their jobs properly. Two or three panel radiators with fins attached can provide far more heat for your building. The ability to run a squeaky clean heating system these days, with a system free of accumulated debris, is a plus for new radiators. Debris, more often than not, inhabits an elderly heating system. Today, correct water treatment is more essential than ever.